สวัสดีค่ะ! (Hello, in Thai!) We are Kevin and Melanie, a couple of oddballs from Seattle, WA, USA who have developed an intense love of travel since our marriage several years ago. Some folks may already be aware that we used to keep a ridiculous spreadsheet designed to maximize every last bit of our vacation days. We’ve taken recent trips to Belize, Europe, Vietnam and Thailand, but have recently realized that our list of places to travel was growing far too long to be satisfied by just two weeks of vacation per year. We had to find a better way to satisfy our wanderlust. So in April 2014, we quit our jobs as engineers at Expedia and Boeing to pursue a new adventure in Southeast Asia. We will be traveling, living, and working here for at least a year. We will be based in Chiang Mai, Thailand through the end of November, with two trips out of the country to visit Singapore and Myanmar. After November, we hope to visit Laos, Cambodia, the Philippines, and Indonesia. Over the course of the next year, we’ll blog about our travels, adventures, and the inevitable mistakes we’ll make along the way (like how we almost got quarantined in Beijing Airport.) We hope that reading about our mistakes will make your travels more pleasant; at the very least, we hope to give you a laugh. Safe travels, friends! I’m so excited for you both in this journey! I can’t wait to read the blog and find out about all of the amazing things you’ll be doing! Stay safe and have more fun than you’ve ever imagined! Love love! I had to join the Navy for four years to travel the world. 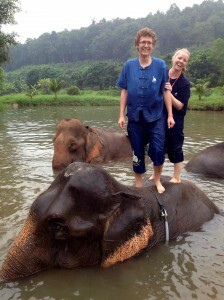 I didn’t know you could quit your job and rent elephants to travel the world!! Wow! How fun is this? Good luck on your adventures. Linda and I bought an Rv to travel. She doesn’t ride on animals well. We look forward to following you!!! Thanks, Linda and Cary! I think I’d agree that an RV might be a better choice than an elephant – definitely more comfortable, probably easier to keep clean too. Best wishes to you two on your road trips! Cary I didn’t know that about you both; how fun. Enjoy your RV travels!!! You guys never cease to surprise me! May the ride rise up to meet you… I look forward to keeping up with your many adventures. Will be following closely. Very envious. Hope to do something similar someday! Will! Thanks for your comment! It’s so fun to see who is reading the blog. I hope you decide to do something similar someday, too. I think this is a once in a lifetime experience that everyone should get to have – I wish the U.S. encouraged a gap year after college like so many other countries do. Hopefully your parents won’t be mad at me for encouraging you. When I first heard of this caper, I decided you must have been sent over there to find that airplane. Doesn’t look like it’s ever going to be found. Seriously though, nice blog site! So glad I didn’t have to sift through Facebook to learn about your trip. I really like that Mark Twain quote. Inspiring to hear of a dream made to come true. Hi Hunter! Thanks for following the blog and leaving a comment! Kevin and I feel very lucky that we get to be over here doing this – it is certainly a dream come true. I hope you’re well! Hi!! I just left you a message on Reddit as well. I’d love to get in touch with you as my (now) Husband and I are thinking of spending time in Chiang Mai in the near future. We just got back from our honeymoon in Indonesia and loved every minute of it. We’d like to eventually step away from our 9-5 jobs here in the states and do some major traveling in SE Asia and beyond. Anyways, I’d love to learn more about your experience if possible-the blog is great! Thanks! Hi Katie! I just replied to your message on Reddit. I was so excited to get this comment on our blog – if we can convince just one person to do this, our mission can be considered complete. excellent note… I have planned my trip to Cambodia this month end. I’m still in the process of reading your stories, and let me tell you…. I usually hate reading blogs Thank you for the info and humor! My fiance and I are doing our honeymoon to a couple of those places and we’ll be able to use the info! Where did you and your fiance end up going for your honeymoon? I’d love to hear an update from you as well. We ended up spending just one year abroad because we missed our friends and family SO MUCH while we were gone! We came home, got new, more flexible jobs that we both enjoy, and have a little girl that turned a year and a half old today. I’m hoping to start blogging again soon about traveling places with a kiddo – then the “we’ve made a huge mistake” blog title will be truer than ever. To answer your question about funding while traveling, we rented our house out while we were abroad. We were very fortunate that we bought our home at the bottom of the market after the housing bubble burst, and rent prices have been very high here for years. We made enough money each month off of the difference between incoming rent and outgoing mortgage payment to cover our rent and utilities while we were living in Chiang Mai, and used savings to pay for our other living expenses (which were incredibly low while we were in Thailand!). Once we left Thailand and headed to Europe, we basically started hemorrhaging money. We were able to stop some of the bloodflow by traveling so slowly – I got REALLY good at messaging tons of Airbnb hosts and asking for discounts for longer-term stays. I don’t think we ever paid more than $900/month for lodging in Europe, which was great. My husband also did some consulting work on the side while we were traveling for individual clients, which helped a bit. I should put a blog post up for this, but I think we spent something like $25k for the entire year by being fairly thrifty (with occasional splurges, for sure!) and spending so much time in Thailand. That is far less than we’d usually spend back home in Seattle! Thanks for your comment! I love getting messages like this on my blog, and it helps sway me back to a place where I want to start writing again. Cheers!